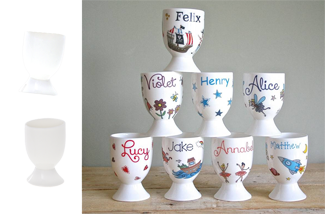 Shown here as blank white egg cups available via Eileen Hallam Ltd, and also beautifully decorated and personalised with her own digital ceramic decals by Michelle at Sparkle Ceramics. Bone china pet bowls, made in Stoke-on-Trent, Staffordshire. 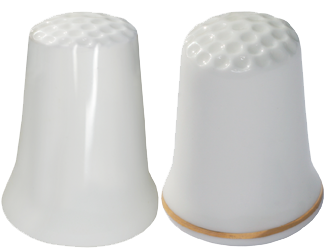 A wide range of white bone china thimbles in different shapes, and including 1 in terracotta. The thimbles can all also be supplied in black. Decoration shown here is by gilding, platinum band, and / or digital ceramic decals. Holds 12 thimbles - ideal for sets of 12, eg Flowers of the Month, 12 days of Christmas, the Tudor dynasty, signs of the Zodiac, Chinese astrology, face cards in a deck of cards, cricket team, the 12 Labours of Hercules, etc, or just your 12 favourite thimbles! K range White bone china shapes, suitable for pendants, fridge magnets, etc. Made in Worcestershire. Wide variety of sizes. Supplied with or without hole. Suitable for pendants, cuff links, fridge magnets, etc. Strictly made to order. 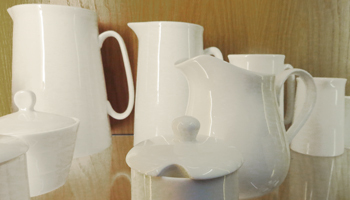 The mugs from China are only supplied on a pallet (typically 1440 mugs), unless customers arrange their own collection from Stoke-on-Trent, but other options are available. 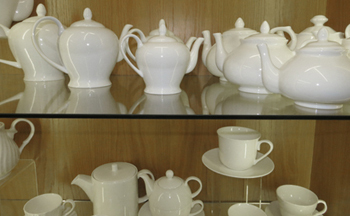 A wide variety of shapes and sizes of teapots, jugs, sugar bowls, cups and saucers, plates, etc. ***If you are intending to decorate the ware with ceramic decals, please see our page: Ceramic decals.